Stunning lipstick set! Congrats, dear! Congratulations on Top Set ! Glamorous ! Fantastic Set of the Day !! Congrats !!! 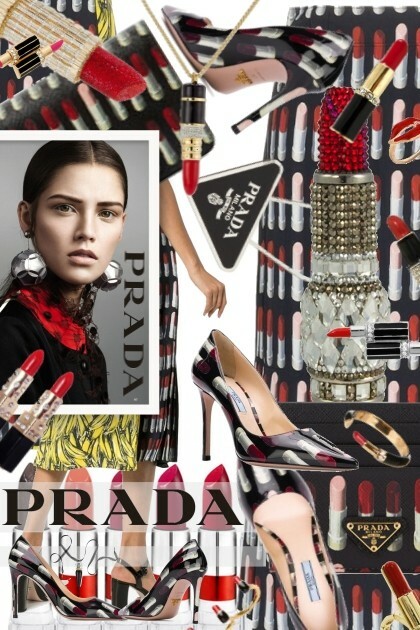 This fall season, Prada brings a young, futuristic vision to the forefront of the brand. Crafted in Italy, this two-tone midi skirt boasts a black front with a red lipstick print along with a quirky yellow banana printed back panel. Incogneato,	audionfashion ,	Lanie ,	shortyluv718,	aqua22,	Aida Susi Silva,	Perla57,	elenaviola	and another 31.